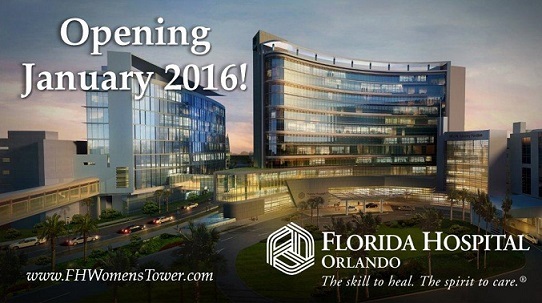 Florida Hospital’s Women’s Tower will open its doors January 21st, 2016, at 601 E. Rollins St. in Orlando. Florida Hospital for Women is a 12-story, 332-bed hospital that will offer obstetrics, gynecology, a level-three NICU, mental health, oncology, breast care, and the region’s first comprehensive program for soon-to-be and new mothers suffering depression and other mood disorders. Florida Hospital for Women will offer a comprehensive healing experience for women of all ages, the convenience of the downtown Orlando location, and some of the area’s most advanced technology. In addition, women’s health navigators, birth coordinators and a dedicated women’s chaplain will be available to patients and their family members. Winter Park recognized as Best Places to Work in Healthcare Florida Hospital Winter Garden – Now Open!